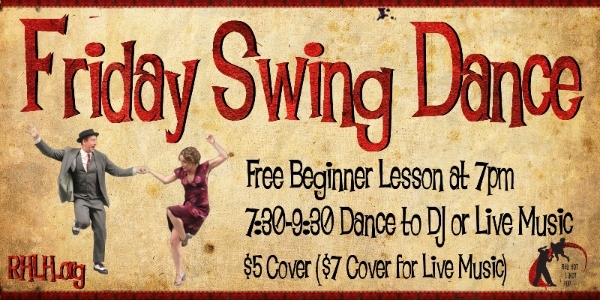 The Red Hot Lindy Hop lesson and session continues at the Rumba Room this Friday night. Free beginner lesson at 7:00 p.m. Free admission before 7:00 and $5 thereafter. Lesson by Jason and Joy with music by DJ Joy. The University of Memphis RHLH chapter hosts a free beginner swing dance lesson every Monday (except school holidays) in Field House. Beginner lesson at 7:30 p.m. More information here. The Tiger Rag lessons and guided practice sessions are back at the Madison Dance Studio in Minglewood Plaza, 1555 Madison Ave Memphis, TN 38104. Learn more and register here. Today's Sunrise Serenade was "Boogie Blues" by Gene Krupa and His Orchestra with Anita O'Day on vocals. Click on the song title to listen courtesy of Jazz On Line. 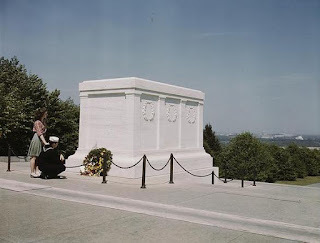 A sailor and his girl at the Tomb of the Unknown Soldier. For Memorial Day weekend, I thought I would dust off a Private Snafu cartoon. These animated training shorts, made by and for the U.S. Army during World War II, featured the talents of many well known artists, including animator Chuck Jones, voice actor Mel Blanc (Bugs Bunny's voice), and lines by Theodor Geisel (a/k/a Dr. Seuss). From the Internet Archive, here is Private Snafu in the 1943 cartoon, Gripes. This morning's Sunrise Serenade was "Lazy Bones" by the Mills Brothers. Enjoy the video from YouTube. 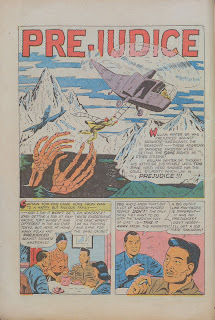 Here is an interesting, post-war comic that takes direct aim at the prejudice Japanese-Americans faced at the time, even those who served in the armed forces and fought the Axis. 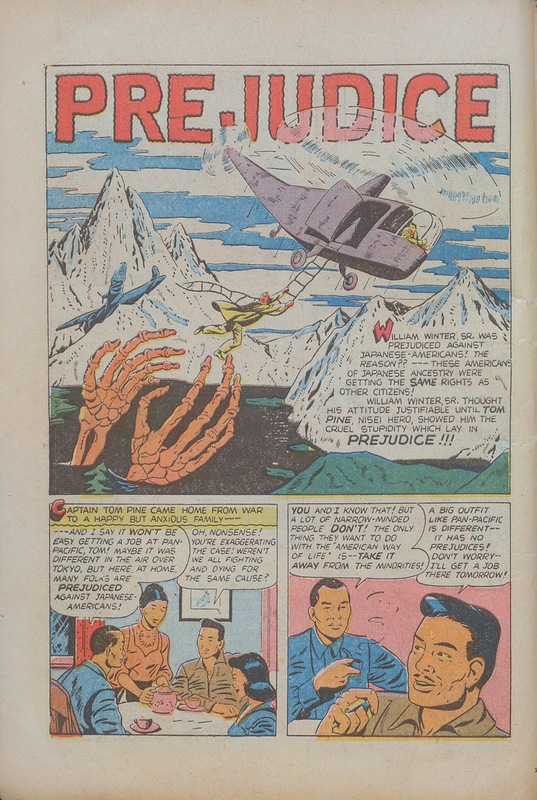 In this comic, posted on Four Color Shadows, a returning Japanese-American veteran cannot get a job with an airline because the boss is prejudiced against the Japanese. In an expected but still exciting twist, our hero saves the man's life. Today's Sunrise Serenade was "Christopher Columbus" by the Ink Spots. Enjoy the video from YouTube. Here is an interesting post from Dull Tool Dim Bulb. 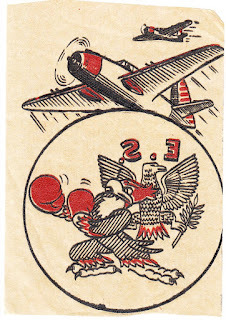 It is a series of circa 1940 paper decals. They were intended for application on uniforms, helmets and foot lockers. 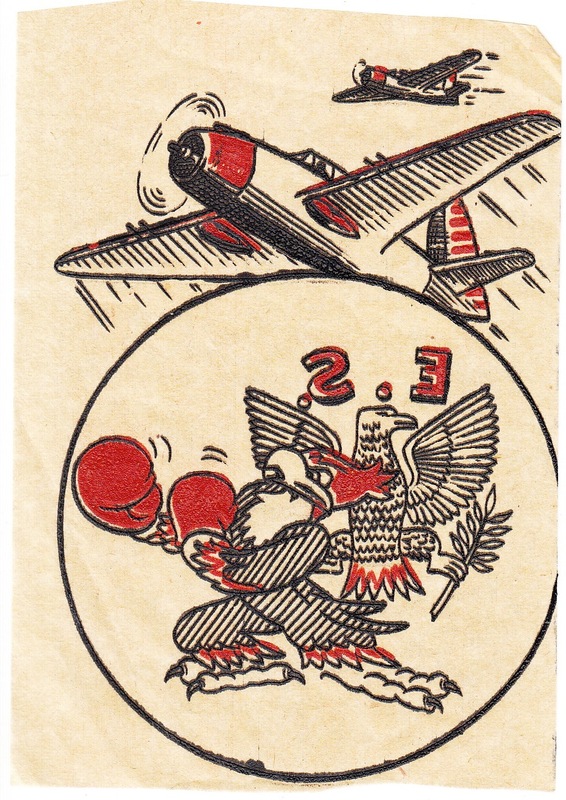 This particular decal appears to be for an Eagle Squadron, which were squadrons of fighter pilots in the R.A.F. formed from volunteer U.S. pilots in the early days of World War II, before the U.S. joined the war. This morning's Sunrise Serenade was "No Name Jive" by Glen Gray and the Casa Loma Orchestra. Click on the song title to listen courtesy of Jazz On Line. 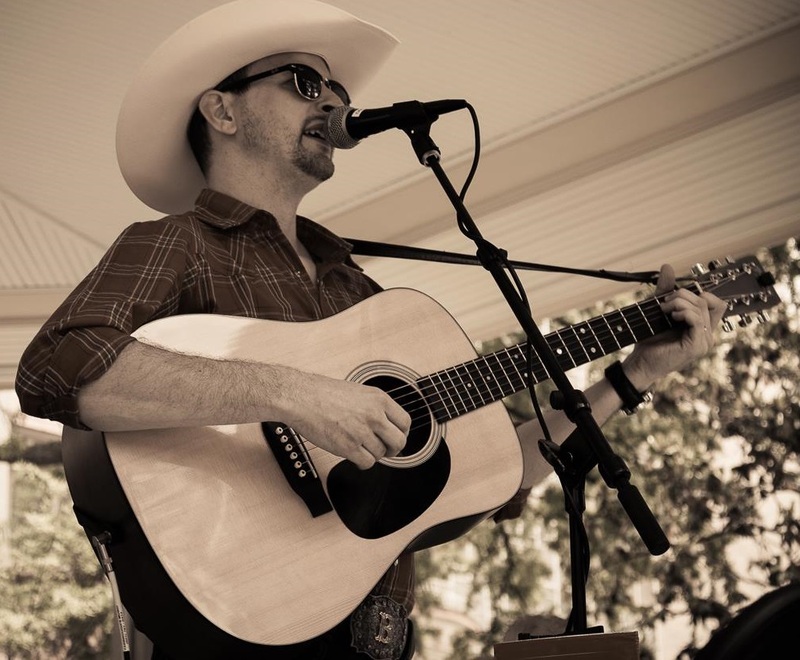 The Red Hot Lindy Hop lesson and session continues at the Rumba Room this Friday night with live Country Fried Swing with Big Barton. Free beginner lesson at 7:00 p.m. Admission $7. Lesson by Mike and Meghan with music by DJ Amanda during band breaks. Today's Sunrise Serenade was "Shoo Shoo Baby" by Ella Mae Morse. Click on the song title to listen courtesy of Jazz On Line. Movie posters always interest me, and posters for classic cartoons even more so, because the subjects were only about seven minutes long, as opposed to a full-length feature. 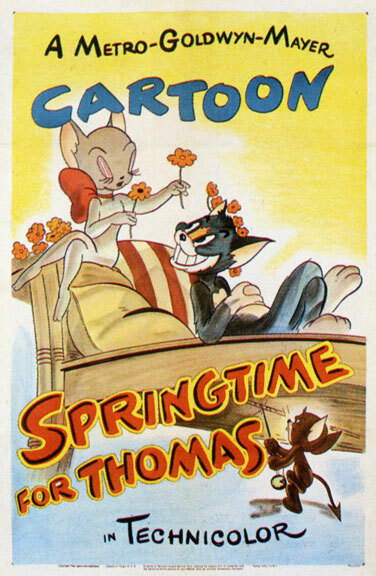 Vintage Ads posted a couple of MGM Tom & Jerry cartoon posters from 1946 and 1950. This morning's Sunrise Serenade was "Cherry" by Louis Armstrong and the Mills Brothers. Click on the song title to listen courtesy of Jazz On Line. This 1932 Harman-Ising cartoon has essentially two separate story arcs. First, a music lesson gone awry, followed by a rained out picnic in the woods. From the Internet Archive, here is Bosko And Honey. This morning's Sunrise Serenade was "South American Way" by the Andrews Sisters. Click on the song title to listen courtesy of Jazz On Line. This news is several days old, but I did not want to let my tardiness prevent my posting it. Madeleine Lebeau, who played "Yvonne" in Casablanca, passed away Monday at age 92. She was believed to be the last living member of this great film's cast. Her two primary scenes in the movie were the one below, and the "La Marseillaise" scene which went viral recently after the Paris terror attacks. Today's Sunrise Serenade was "Exactly Like You" by Louis Armstrong. Click on the song title to listen courtesy of Jazz On Line. The playlist for the May 18, 2016 broadcast of the Swing Shift Shuffle has now been added to the playlist filing cabinet. The Red Hot Lindy Hop lesson and session continues at the Rumba Room this Friday night. Free beginner lesson at 7:00 p.m. Free admission before 7:00 and $5 thereafter. Lesson by Todd and Bethany with music by DJ Bethany. This morning's Sunrise Serenade was "When Paw Was Courtin' Maw" by Glenn Miller and His Orchestra. Enjoy the video from YouTube. Today's Sunrise Serenade was "Be Like A Kettle And Sing" by Vera Lynn. Enjoy this YouTube video clip from the 1942 film We'll Meet Again. I'll be working out of the plant for about a week, so SSS posts will be pause temporarily, but never fear, I'll be back next week! This morning's Sunrise Serenade was "I'm Beginning to See the Light" by Ella Fitzgerald and the Ink Spots. Click on the song title to listen courtesy of Jazz On Line. This morning's Sunrise Serenade was "In A Mellow Tone" by Duke Ellington and His Orchestra. Enjoy the video from YouTube. Today's Sunrise Serenade was "School Days" by Louis Jordan. Click on the song title to listen courtesy of Jazz On Line. The playlist for the May 4, 2016 broadcast of the Swing Shift Shuffle has now been added to the playlist filing cabinet. The Red Hot Lindy Hop lesson and session continues at the Rumba Room this Friday night. Free beginner lesson at 7:00 p.m. Free admission before 7:00 and $5 thereafter. Lesson by Kishore and Angela with music by DJ Alexis. This morning's Sunrise Serenade was "Tico Tico" by the Andrews Sisters. Click on the song title to listen courtesy of Jazz On Line. Better late than never is my noting of The Hollywood Revue's monthly preview of programming on Turner Classic Movies. Robert Ryan is the Star of the Month, with his movies airing every Friday night. The annual Memorial Day weekend war movie marathon rolls in at the end of the month. Today's Sunrise Serenade was "Russian Lullaby" by Stan Kenton and His Orchestra. Enjoy the video from YouTube. This morning's Sunrise Serenade was "Sing, Sing, Sing" by the Andrews Sisters. Enjoy the video from YouTube.